Description: Rare reissue with the original LP jacket design! 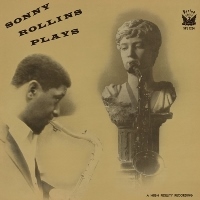 Sonny Rollins Plays is the only album Rollins recorded for a minor label called Period. The recording took place on November 4, 1957, a day after the famous Blue Note live album, A Night at the Village Vanguard. He recorded three tracks, including "Sonnymoon for Two" and his unique take on Tchaikowsky's "Theme from Pathetique Symphony." The band was supposed to go back to the studio to record more material for a 10-inch LP, but it never materialized reportedly because of a dispute about payment. The other side of the LP was filled by three tracks by Thad Jones which had been recorded earlier in two different sessions. Recorded in New York on November 4, 1957 (Tracks 1-3); December 3, 1956 (Tracks 4-5); January 6, 1957 (Track 6). Originally released by Period in 1957. This reissue released in Japan by SSJ Records in 2015. Mono.